In this political cartoon it shows a person from Libya, Obama dressed in female clothes, and a waitress with a check pad. The person from Libya addresses to Obama that it is a pleasure to have him in Libya because he is trying to help the country out even though it has nothing to do with America. Obama on the other hand is shown off as a guy who is attracted to foreigners which is why he is portrayed as a male in female clothing. The cartoonist has shown that Obama has no reason to be so involved in foreign wars when his own country is in crisis. He has gone into Libya without consulting congress and using the budget money for military to aide in fighting the war. The waiter is asking on who would be paying the check, referring to who will pay for the war when money is gone from the military budget. Americans have enough already on their hands and they would not pay for the war. They want Obama to handle the problems of America instead of interfering into other matters that has no benefit towards them. The cartoonist seems to be having the belief that Obama needs to stop with the foreign wars and start working on making America better. "There goes 20 years of paychecks!" In this political cartoon it shows a rocket ship labeled "To Libya" flying towards its destination. Meanwhile there are people standing below it watching it fly over and these people are the teachers. 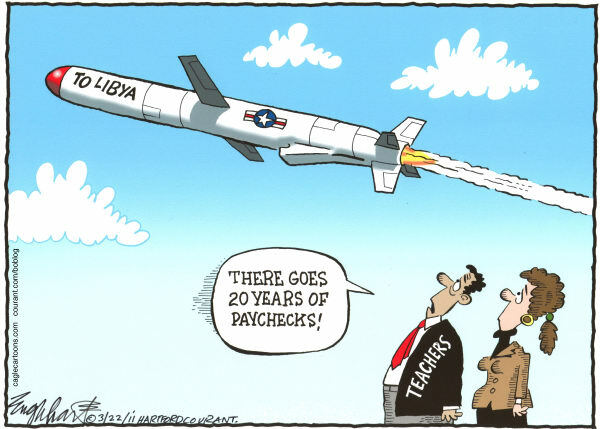 One of the political cartoon labeled as the teacher is shown to say,"There goes 20 years of paychecks!" This cartoon basically portrays the decision on the budget deficit cuts. It was decided that education spending would be cut down by a lot, which would result in more difficulty in maintaining good education throughout America. It is being questioned on how well the government is functioning because of its lack of good decisions. United States is getting involved with a conflict that truly has nothing to do with them. Money is being spent in unnecessary areas as well as things that does not help America get out of the deficit. Americans are questioning why exactly is America using its money that they supposedly do not have since education funding was cut. Congress and the President are taking decisions that seems to make no sense to Americans because they cut in areas money is needed the most and spend in others that are not needed. This political cartoon consist of the character Bart Simpson from "The Simpsons." Bart's shirt has state budget written on it showing that he is the one responsible for writing down what is important and what is not for the state. On the board it is written that "Education is the Future," a saying that has been the motto for schools. 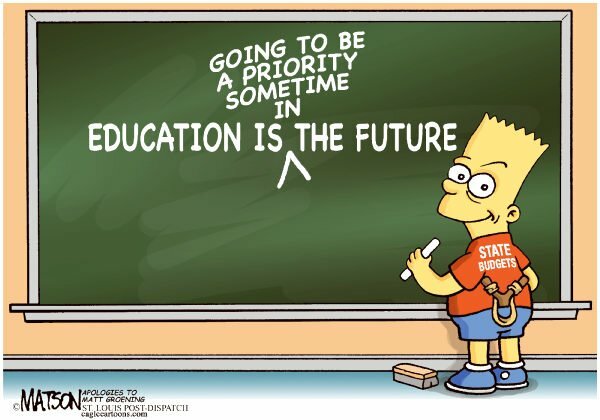 However, Bart put in an addition of "Going to be a priority sometime in," showing that the education budget in many states are being cut down resulting in increase of tuition and various other things. The states do not seem to care that education is a fundamental part of life if one wants to succeed. There have been many controversies and debate of the education budget being cut down. Higher education budget has been decreased a significant amount depending on the state as well as primary schools. In this political cartoon it depicts the democratic and republican party standing up to Obama about what should not be cut for the deficit reduction. The elephant represents the republican party with a caption saying "Tax cuts and military spending are off the table," which symbolizes what they truly stand for. On the other hand, the donkey representing the democratic party with caption saying "Social security and medicare are off the table," shows that those are the issues they do not want budget cut off of. Obama, in the political cartoon, is trying to be optimistic and show that they have an empty table on which they need to figure out in which areas they should cut the spending. This political cartoon tries to illustrate the discussion going on about where budget spending should be cut. There are many disagreements among the political parties due to their beliefs on certain issues and topic. Despite the differences between the parties, they have to come up with the areas they will cut spending in order to reduce the budget deficit. This political cartoon depicts the budget crisis the nation is having, which is forcing them to take out money used in certain areas to continue using money in other areas. Such as the educational funding the USA gives to the state schools being deduced due to not having enough money to spend. They plan to shut more schools and lay off teachers as well as increase the classroom size. Education is already having trouble because schools have always had difficulty maintaining enough money. They use the common "I did my homework but my dog ate it" logo but instead the child talking about the crisis going on around the nation. 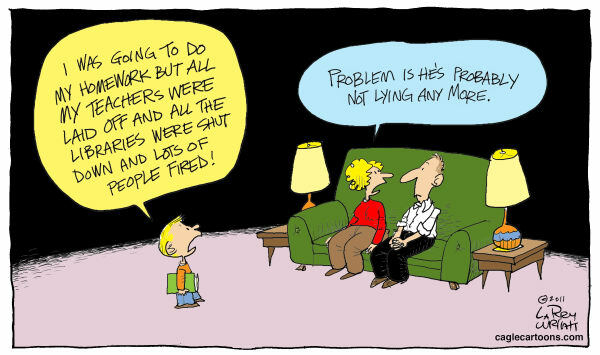 The parents can not say anything to the child because they know he is telling the truth.